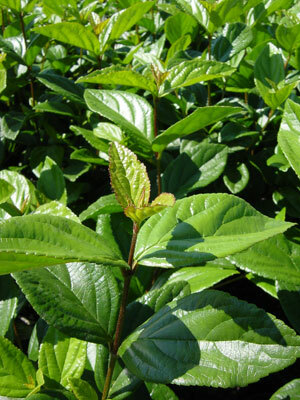 Viburnum suspensum is a dense compact evergreen shrub native to the Ryukyu Islands of Japan and is covered with leathery dark green leaves. The leaves are oval in shape and have serrated edges. In late winter to early spring 2-4″ clusters of light pink tubular flowers appear, which attract bees and butterflies. These flowers will be followed by red berries that will darken to black with age. Sandankwa Viburnum is a popular landscape shrub in climates with mild winters. It is best to not shear this plant back it responds better to selective pruning, also be sure to plant in a well drained location. This shrub can reach 6-12′ x 6-12′ at maturity and should be spaced every 2-3′ apart.